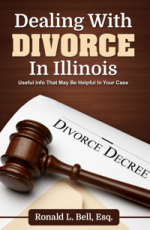 Unless stated otherwise, Illinois spousal maintenance may be modified when either party has a significant change in circumstances such as a remarriage, a change in employment status, a loss or gain of income, tax considerations and more. However, there are other forms of maintenance agreements that have different conditions regarding modification, including reviewable maintenance – also known as rehabilitative spousal maintenance. Reviewable/rehabilitative maintenance is used when a one spouse needs support until he or she becomes financially self-sufficient following the divorce. This is often the case if one spouse stayed home raising children while the other has pursued a career. Rehabilitative maintenance can continue indefinitely, but the court will review the agreement after a predetermined amount of time to reevaluate the circumstances of the spouses. If the court determines that the recipient has become self-sufficient or, conversely, has not made a good faith effort to become so, the maintenance payments can be stopped. However, in some situations, despite their best efforts a recipient may come up short on employment. Being out of the job market for an extended period of time, for example, may make it difficult to land a position that not only makes ends meet but also allows the recipient to lead a lifestyle similar to the one enjoyed during the marriage. If the recipient has made a good faith effort, demonstrated by a willingness to seek training or education to secure employment, or is employed in a job commensurate with their experience and abilities but is still struggling financially, maintenance may continue indefinitely. Of course, when the court reviews a maintenance order a recipient must prove his or her attempts to become self-sufficient. It may be that there are extenuating circumstances that are hindering his or her effort to secure gainful employment and it may also be that parenting responsibilities are getting in the way. On the flip side of the coin, a payor also has an opportunity to request a reduction or elimination of payments based on a significant changes in his or her financial circumstances. If you have questions regarding rehabilitative spousal maintenance, contact the Libertyville Family Law law offices of Ronald L. Bell & Associates for immediate assistance by calling us at 847-495-6000. You can also fill-out our online contact form.